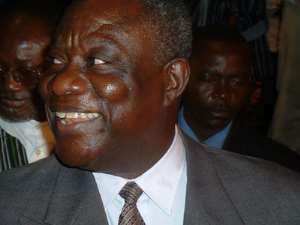 .. No Justice for Ya Na, Alhaji Mobila Accra, Jan 23, GNA - Professor John Atta Mills, National Democratic Congress Presidential Candidate made his first public pronouncements after the 2004 elections on Saturday describing the elections as one that was fraught with many wrongs and therefore unfair. "Election is not about who wins but about how the election is won. Can you use bribe, threats and intimidations to win an election," Prof. Mills asked hundreds of party supporters who thronged the Mantse Agbonaa Park for a thanksgiving rally. The rally was to express gratitude to party faithful and Ghanaians who demonstrated their commitment to the party, which manifested in the higher voter turnout in the election. Prof. Mills said, from what happened in the 2004 election, "We showed to the world that if you can't win an election you could burn ballot papers, and threaten returning officers in order to win. "I haven't spoken after the elections because I want to find time to talk to the people for taking part in the election and to congratulate them," he said. Prof. Mills said immediately after the election several letters came to him from supporters requesting to go on a demonstration against the wrongs, but he disapproved because "I don't want a drop of blood to be shared. We don't want to lose any life". He said if things should continue the way they saw it, "A time will come when some of us leaders will no longer be able to contain the situation. "Ask the family of Alhaji Mobila, and other Returning Officers whether justice has been done?" he said. Prof. Mills said it was surprising that congratulatory messages started flowing in for having had free and fair elections and asked, why the opinion leaders had remained silent on reported cases of election malpractices. "We have to be wise and vigilant about how the elections were conducted and know how they were over," he said. Prof Mills concluded his statements saying, "Some are worried about whether I will stay in the country or not. But I want to assure everybody that I will not go anywhere. "I will be around to assist the party reorganise itself for the 2008 elections. Once beaten twice shy," he ended. Ex-President Rawlings explained what he meant when he said, "I can't wait for 2008 to come" and said Ghanaians should not wait for another four years to end before they see the New Patriotic Party (NPP) government dispensing justice. "A constitutional government must be able to give justice today and now. "We waited for four years to pass without demanding it and if we have to wait for another four years before justice is done to our people then what's the essence of the Constitution. "If we can't have justice for Ya Na, Alhaji Mobila, the murdered women...Let's show that we can stand up for our political, economic and social rights," former President Rawlings said. Dr Obed Asamoah, Chairman of the party called for new strategies for the road towards the 2008 polls and asked all executives in the various regions and constituencies to begin to map out effective strategies to unite members. He congratulated party executives and members for their yeomen job, which he said, manifested in their performance in the election. Dr. Asamoah said an important duty ahead of them now was to work towards keeping the NPP government on its toes at all times and this should not be left to the minority in parliament alone. Other optional statements from party officials, some of whom came from other regions stressed the need for party members to unite and bury differences in order to remain a formidable force to recapture power in 2008.